Allow me to introduce Myself: I'm a Hippopotamus! What I Like to Eat: During the day while in the water, we eat water plants. At night, we travel on land and graze to look for grass, leaves, fruits, and vegetables. Betcha Didn't Know This About Me: Because we don't have sweat glands, we hippos love to cool off in rivers, swamps and lakes. Who We Are: We are the third largest living land mammal and rightly deserve this title due to our enormous girth. Our name, hippopotamus, comes from the Greek word for "river horse". Family: The whale is our distant cousin. Get Me Bodied: We like to think that our entire body is our best feature. We have large bodies, huge heads and short legs. Our bodies alone (excluding our tails) are about 12 to 15 feet long. Our four webbed toes found on each foot, serve us well as we walk with poise along the bottom of rivers and lakes. Aqua Boogie: We are excellent swimmers and divers and are able to stay underwater for about five minutes or so at a time with our nostrils, eyes and ears closed. When our heads are partially submerged, we can still breathe, see and hear because of the positioning of our nostrils, eyes and ears on our heads. 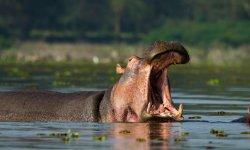 Weight Watchers: A large hippo living in the wild can tip the scale at about 5,800 pounds. Some of the smaller hippos weigh between 2,500 and 3,000 pounds. My Biggest Predators: Humans. Poachers hunt us for our meat (soup is one of their delicacies) and canine teeth, which can grow to be two feet long, and are made from ivory. Farmers have taken our homes and turned them into their croplands. We've been told there are less than 150,000 of us left in the wild.